There is a simple answer, but it may not be EASY. I have the quote, “Patience is a virtue Miss Lynch” engrained in my head. The first time I heard it was my sophomore year by my English teacher, Mrs. Kolder. I can remember exactly where I was sitting and where she was standing when she said it. Mrs. Kolder was getting ready to pass out our speech topics and I was so nervous that I was being very impatient. Looking back on it, I think Mrs. Kolder pretended that the topics had been chosen randomly, but had purposely picked my quote for a specific reason, patience was not my specialty. I don’t remember anything about the speech I gave, except that quote, it is stuck in my head forever. 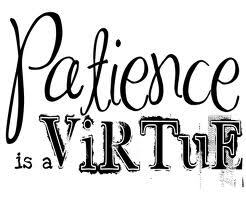 In today’s world, patience is not a quality many of us have, if we don’t get that instant gratification, we are not happy. 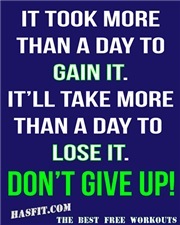 We see it in everything we do…if we don’t get immediate results, we quit. At work, when the “system” goes down and we can’t get into our emails, grade book, etc. we are a mess. Another example is our cellphones. I was at dinner recently and a group of us were discussing a topic on frostbite. We weren’t sure of the side and long term effects. What did a few of us do….pulled out our phones and “googled” the question. We had the answer instantly. This morning, in the car on our way to church, Jim and I were discussing Brian Urlacher’s body (more on that next week) and he googled, “Brian Urlacher’s body” (yes, next week will be a good blog) instantly, we had a picture of him, lots of them. There are so many more examples, thousands of them. Think about those ads that say “get rich fast”. If none of us fell for the advertisement, it wouldn’t exist, but we do. People want to get rich fast and the easy way. College graduates think they are going to graduate, get a job, and make a lot of money doing it, but it takes hard work and time. Falling in love is easy…staying in love is hard work and takes time. Having a good basketball shot takes lots of practice, which is hard work and time. Being a good writer means reading lots of books and writing a lot. Most “lasting” things take hard work and time. One of Ryan’s Christmas gifts this year was a Duck Commander Devotional. Each day he reads a bible verse and then one of the members of Duck Commander summarizes how that verse applies to his/her life and possibly ours. Ryan seems to be enjoying the book and each day he reads it to himself and then shares it with me. One of the recent devotions was how we usually ask God for the “easy” answer when things are hard. We want things to just be “fixed.” To just be gone. To just be right. To just go away. To just get better. To just be done. In this devotional, Korie (Willie’s wife), writes how God gives us the simple answer, but it is not always easy. She makes the point that to most things, there is a simple answer although it may not be easy and may take a great amount of effort. 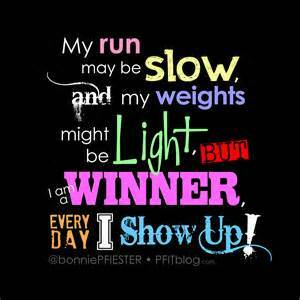 This is where I am making the jump to getting in shape or weight loss….stay with me. There are no “MIRACLE” drugs, exercises, diets, or even prayers that will allow us to lose the weight or develop the body we want. It is not EASY, but it is SIMPLE. We have to work out and eat healthy. We have to WORK at it. It takes TIME. I’m not going to lie. It’s not EASY. I have tried some of the easy solutions, they don’t work. In my college days I tried those diet pills. I have even debated that silly Dr. Oz pill that is out there, garcenia cambogia, and then came to my senses. I am always looking for the faster workout, so I don’t have to put in as much time. The TRUTH of the matter, is that it takes hard work and time. WHAT IS STOPPING YOU? Tell me what you need. Do you need a different time slot? Do you need a little “pre workout” meeting prior to your first time so you feel comfortable with the workout? Do you need me to email you the workout the day before so you know what to expect? Do you need me to save you a spot in a specific spot in the room? TELL ME!! I want to help you.